It's important to to learn correct lawn irrigation techniques. Here are some tips to help you save water and grow a healthy lawn. Most lawns need about one inch of water per week. Every yard is different though. Sandy soils may require more water, heavy soils less. It's best to water deeply and infrequently. Allow the soil to dry between watering and water for longer periods to encourage deeper, stronger roots. Frequent, light watering promotes shallow roots. 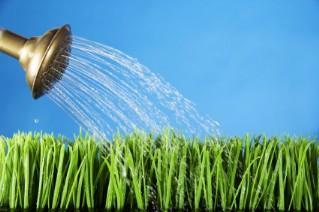 Your grass then becomes dependent on you to provide the water that it needs. A lawn with a strong root system is able to survive summer heat and drought. In many climates, a healthy lawn can survive several weeks of summer dormancy, with little or no water, and green up again in the fall. Always heed water bans or restrictions in your community. Water is a finite resource and must be used wisely. Morning is the best time to irrigate your lawn. Avoid watering in the middle of the day when more water is lost to evaporation. Watering in the evening increases the risk of disease, because grass stays damp all night. Newly planted lawns need more frequent irrigation than established lawns. Depending on the weather, new lawns may need to be watered daily. Water enough to keep the soil moist, but not too wet. Over watering can wash away seeds, make seeds rot, cause disease, or slow the growth of grass. As the grass becomes established, water less frequently but for longer periods to promote deep roots. You don't need an in-ground system to have a nice lawn. A good garden hose and lawn sprinkler will suffice. Select a sprinkler based on yard size and shape. Try to supply a uniform amount of water to the entire lawn. You can monitor this by placing containers at various points beneath the sprinkler's pattern. Measure the quantity of water captured in each container and overlap sprinkler patterns to supply the entire lawn with a uniform quantity of water. An in-ground lawn irrigation system can save you time. Lugging a garden hose and sprinkler from spot to spot is a lot of work, particularly if you have a large yard. Adjust your irrigation system based on current weather. There's no point in watering during a heavy rainstorm, for example. Soil can only absorb so much water at once. Change your watering schedule with the season. Your lawn needs less water during the spring, fall, and winter than it does during the summer. Program your timer to water in cycles. Heavy soils and slopes sometimes can't absorb water fast enough to prevent it from running off. Program your timer to water for several shorter periods, with about an hour in between, to let the water soak into the soil. Some homeowners install lawn irrigation systems themselves, while others hire professional installers. Lawn irrigation systems consist of timers, valves, underground PVC piping, and sprinkler heads.Two common types of sprinkler heads are spray heads and rotor heads. Some sprinkler heads pop up out of the ground when the system is activated, while others remain above ground at all times. Spray heads have a high application rate, meaning they discharge a large volume of water in a short amount of time. For this reason, sprinkler systems with spray heads are best for flat surfaces. Rotor sprinkler heads have a lower application rate, so they can be used on slopes. They also apply water more uniformly than do spray heads, making them better for watering large areas. Careless watering can damage your grass and wastewater. But runoff from your yard creates other problems, too. Sprinkler runoff flows into storm sewers, carrying soil, pet waste, fertilizers, and other pollutants into nearby lakes and streams. It's important to practice careful lawn irrigation to keep our plants healthy and our waterways clean.